Tulsa Solutions Ministorage has been trusted with storing Tulsa’s neighbors and businesses for over 15 years. Tulsa Solutions Ministorage allows for free reservations. We’ll help you take the hassle out of your move here in Tulsa. No long term contracts that force your hand here. Tulsa Solutions Ministorage provides month to month service. New customers or current customers upsizing to a larger unit can receive their first month for FREE! Tulsa Solutions Ministorage provides convenience and security for all your storage needs. Locally owned and operated for 15 years, you can trust us for your commercial and residential storage needs. Tulsa Solutions Ministorage is proud to have helped our friends and neighbors keep their belongings safe and secure right here in Tulsa for many years. You can trust us for your business and residential storage solution needs. We have storage units in all sizes, ranging from 5 x 10 to 15 x 40, to suit either commercial or residential customers. Our key-coded gate offers computerized security access to the walled storage area, and the ramps and raised floors provide extra peace of mind. Located near the I-44/Broken Arrow Expressway interchange, a couple of blocks off a major street. We are convenient to all areas of the city, but also offer easy access away from traffic. Tulsa Solutions Ministorage can help you take the stress out choosing the right storage unit with our storage unit size guide. We know that budgets are not meant to be broken and we want to help you choose the right storage space for your situation. 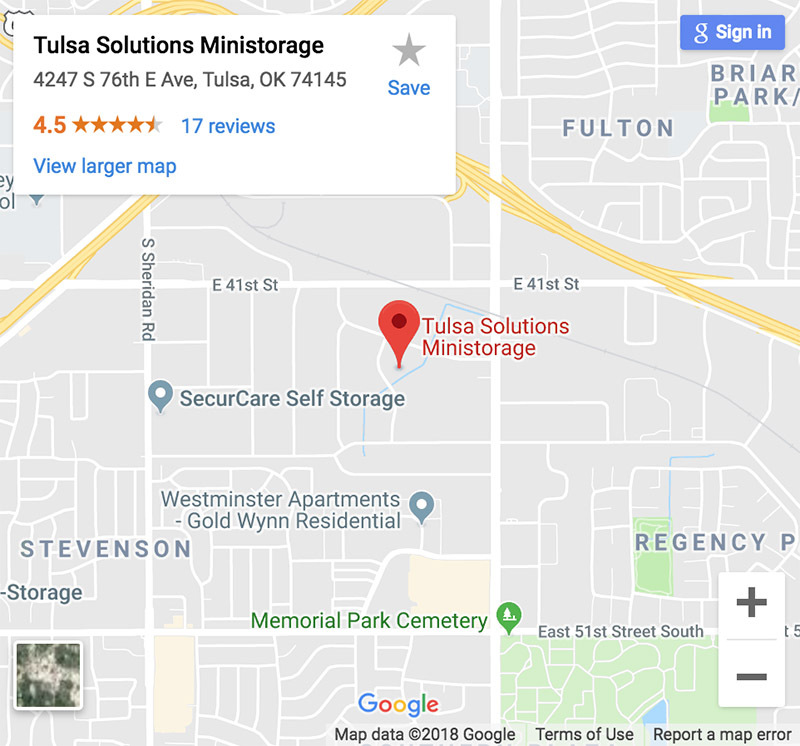 Why Choose Tulsa Solutions Ministorage? Tulsa Solutions Ministorage gives you access to your storage unit every single day of the week. We’ll make sure that you can safely access your unit anytime you need to. Tulsa Solutions Ministorage provides commercial and residential storage solutions that are safe and convenient to make sure that you’re able to get in and out with ease. No long term contracts that force your hand here. Tulsa Solutions Ministorage provides month to month service so that you have flexibility for any situation. Tulsa Solutions Ministorage has been a leader in storage unit service here in Tulsa for over 15 years. Tulsa Solutions Ministorage provides a wide range of storage unit sizes for every type of move. Tulsa Solutions Ministorage has drive up access to every door on our property. We make it easy to store here. There are always unknowns during a move. We can help. If it’s your first time using storage here in Tulsa, don’t worry. We’ve got you covered with packing, moving and storage tips that will save you time. We’ll help you with the details and show you how to choose the right storage unit for your needs. We know that every storage situation can be unique and bring challenges. At Tulsa Solutions Storage we work hard to minimize those challenges and help you get the right storage solution for your needs. Contact us today with any questions you may have about our storage units and services. 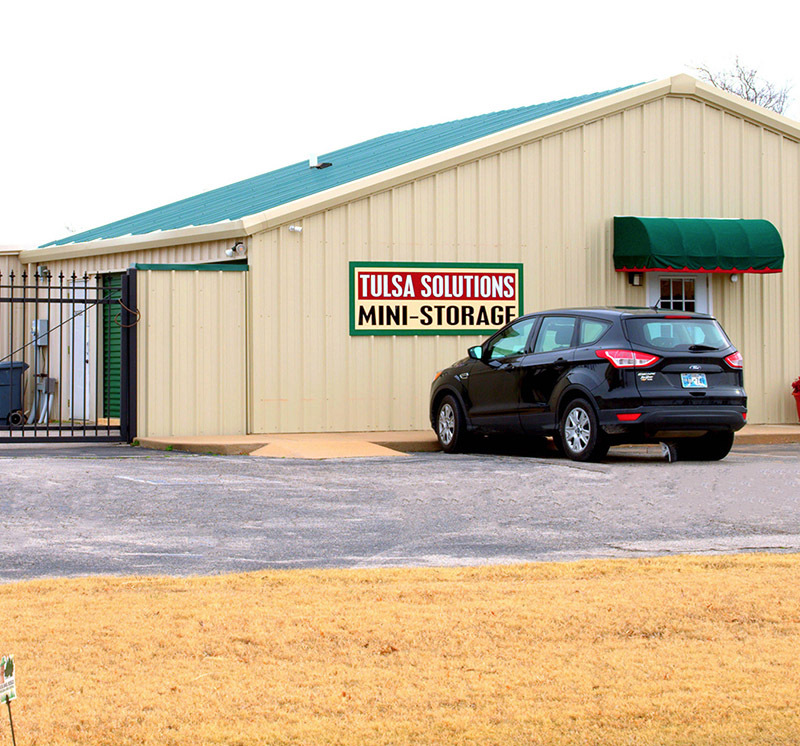 Tulsa Solutions Ministorage is located near the I-44/Broken Arrow Expressway interchange. We are a couple of blocks off a major street, convenient to all areas of the city, but also offer easy access away from traffic.